We spent most of the 13th week and hit 14 weeks in Chicago (post coming soon). Now that I am in my second trimester according to ALL sources (they vary), I celebrated with a virgin Mojito and one my best friends, Erika. This pic was taken at the airport before we headed home (14 weeks 2 days). Sleep: great…traveling and sight seeing is tiring so I hit the pillow hard! Best moment this week: Seeing Chicago with my honey and baby in tow...and going to Erika's! Happy or Moody most of the time: Mostly happy on vacation…one day of moodiness due to hunger, achy feet, and tailbone pain. Looking forward to: Getting a noticeable baby bump and finding out the gender...and Matt's brother, David, graduates college this week! 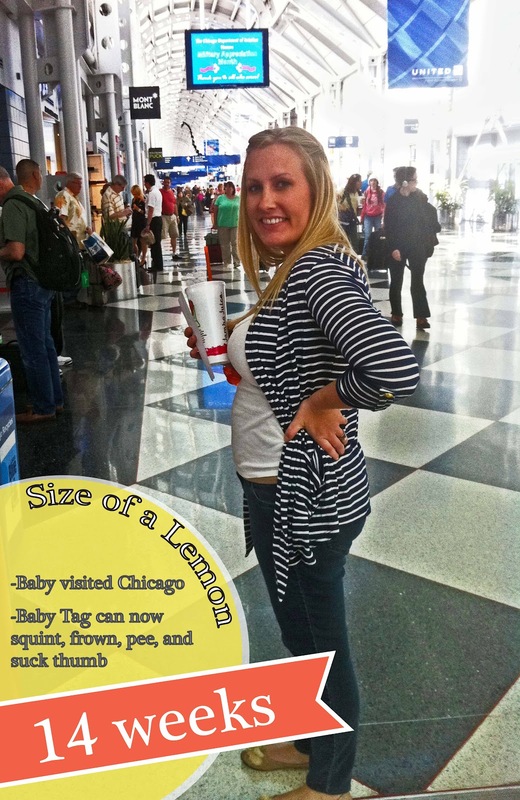 We headed to Chicago the day we took our announcement pics...on what was supposed to be a 2.5 hour flight that turned into 7 (on the plane…sweaty and hot). That plus the fact that I needed my water and snacks…I was soo uncomfortable. We finally got to Chicago at 11 pm and found Mother Hubbard's, on Hubbard street, right next to our hotel to eat. We announced the pregnancy on fb the next day (while it was raining in Chicago)…and spent the rest of the week seeing the beautiful city of Chicago. I took a belly pic at the bean (at 13 weeks 6 days), but it was hard to see. I have felt pretty good this week. The only time I would get nauseous is when I wouldn't eat, so I carried snacks in my purse. Touring the city was exhausting, but I also started allowing myself some coffee and tea this week so that helped. Most of the issues I had were due to the cold weather (HATE), walking or sitting too much (tailbone pain), wearing the wrong shoes, or carrying a heavy purse filled with snacks and water. This trip felt babymoon-ish even though Matt had to work all week. I went shopping one day while Matt was working and found a lot of versatile dresses I can wear this summer...then I made myself stay in the hotel the rest of the week because of all the damage I did haha. We capped off the week and celebrated 14 weeks with Erika and her family. We stayed with them over the weekend and I got my much needed girl gossip/gripe time. We also got a little bit of training with their 2 kids...no changing of diapers or anything...just being around them which Matt and I aren't usually around kids. Having them (being experienced with both genders) to bounce things off of is a great asset to have. Happy (late) Mother's Day!